During large scale military operations in recent years, European air forces have relied heavly on US tanker suport in order to operate effectively. This was realised during operations over Serbia 1999 and Libya in 2011. During the Libyan conflict, the entire contribution to the air refuelling force by non-U.S. NATO countries was only about 12-15 aircraft. France deployed six Boeing C-135FRs; Canada deployed two CC-150 Polaris; the Netherlands committed one KDC-10; the Swedish committed a single C-130 Hercules; the Italian’s a single Boeing KC-767; with the United Kingdom having two VC-10s or Tristars at Decimomannu and a variable number of aircraft working out of RAF Akrotiri, Cyprus. This meant that excluding the USAF contribution, the NATO alliance could only establish a 1:10 tanker/fighter force ratio during Operation Unified Protector. Air refuelling aircraft are key to military air operations as ‘Force Multipliers’; enabling fighters, transport aircraft and Airborne Warning and Control Systems (AWACS) aircraft to remain airborne for longer periods. The European nations have a very small number of tanker aircraft when compared to the United States. In 2017 Europe have a total off 49 tanker aircraft of 9 diffrent types owned by only 7 EU countries, whereas the US has over 500 tanker aircraft of three diffrent types. To make the best use of limited number of European tanker aircraft, the European Defence Agency(EDA) created European Air Refuelin initiative in 2012. This resulted in the creation in 2014 of a dedicated air to air refuelin cell under the European Air Transport Command (EATC). Unfortunately the French and US tankers participate only first few day of the exercise. EART is organised on a yearly basis in combination with the ‘Frisian Flag’ fighter training exercise, also organized by the Netherlands, that operates from Leeuwarden Airbase. The objective is to train air crews and engineers in planning and executing complex air-to-air refuelling (AAR) operations in a multinational and realistic COMAO (composite air operation) environment, with the overall aim of enhancing effectiveness and interoperability of forces. A particular focus is also put on facilitating the certification processes between tankers and receiver aircraft. Typical day of exercise is started early morning with briefing and in 9:00AM the tankers departs from Eindhoven AB. After aprox. 4 hours of flight the planes are returning to AB and begin to preparing for the second wave of the day. During the flight the tankers is waiting the fighters from Frisian Flag in two reserved areas over the North Sea, close to Frisian islands and coast of the Danmark. During the flight is training: Air to air refueling with multinational recivers, multi tanker formation, tactical procedures, degradated communication procedures, comm jamming, snake climb accompanied letdown, long range mission, practice large scale LINK-16 and airspace control operation in multinational context. On 12 April the afternnon task involve KDC-10 and A-310MRTT tankers after aprox. 40 minutes of flight in the refueling areas started to arrive the recivers. The Airbus A310 Multi-Role Tanker Transport (MRTT) aircraft is provided with two AAR pods, one under each wing. The system comprises a refueling hose container under the wing that deploys a refueling hose with a maximum length of 23 m during flight. Today, four of these Airbus A310 MRTT aircraft are operated by the German Air Force for air-to-air refuelling, medical evacuation, military cargo transport and passenger transport operations. During this mission we flew over the Frisian Islands where six Eurofighters from the German Air Force and four Rafal’s from the French Air Force joined us for their refueling training. 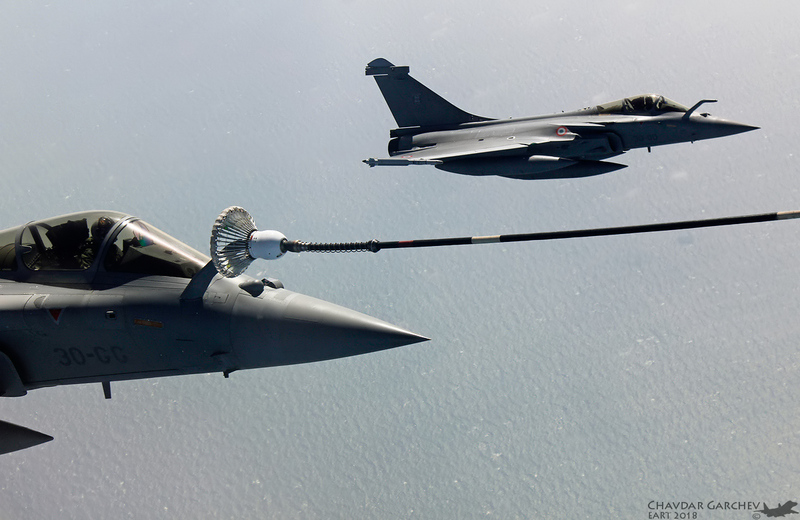 During this refuelling, the fighter jets were provided with 2,4 Tons of fuel per minute at FL250-270. The Dutch KDC-10 task was to refuel eight Dutch F-16 but due to technical problem he was returning back to Eindhoven. They are very rare aircraft with interesting faith, original they are wide body DC-10 airliners from Martinair Airlines In June 1992 the Royal Netherlands Air Force bought DC-10. Both DC-10 were converted to multi-role tanker/transports and entered service in 1995.In present day Royal Netherlands Air Force only two KDC-10 is still in service to 2020. The future in Air to Air refueling in Europe is connected with Airbus A-400 the plans for which they are to be equipped of extra refueling pods by for example receiver nations thus increasing the amount of tankers without acquiring additional aircraft and Airbus A-330MRTT. In July 2016, The Netherlands and Luxembourg signed a Memorandum of Understanding to proceed with the acquisition of a pooled fleet of Airbus A330 Multi Role Tanker Transport (A330 MRTT) aircraft. The great advantages of a pooled fleet is: Cost efficent acces to air to air refueling capability, you pay for the amount of hours you need, you bay a wing and get access to fleet of 8-11 aircraft. On 25 September 2017, the contract was amended to include two additional nations as participants in the MMF project: Germany and Norway. This amendment of the contract increases the scope of the project from the two A330 MRTT aircraft (initially ordered by The Netherlands and Luxembourg) to seven aircraft in total. In January 2018, Belgium formally joined the project. With Belgium’s participation, the fleet grew further to eight aircraft. In order to facilitate the joining of new interested nations in the future, there are still three options for additional aircraft in place (potential increase to 11 aircraft in total). The delivery of the eight A330 MRTT aircraft is expected between 2020 and 2022.